Halos on the surface of frozen puddles were captured again by Dávid Hérincs in Egyházasrádóc, Hungary. His previous observations can be seen in an earlier post on Halo Vault ( 1 ). 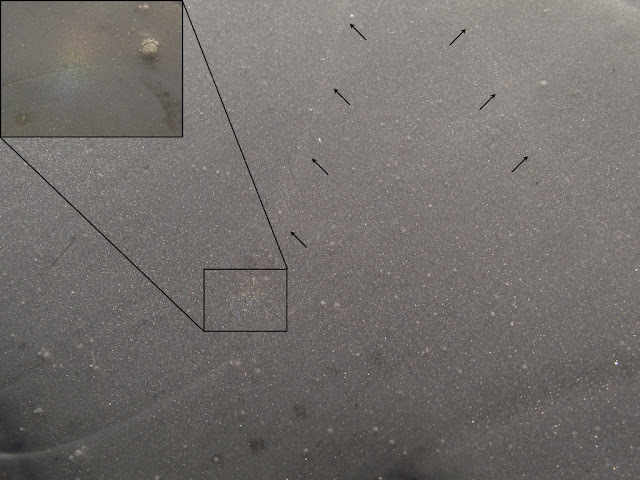 On 6 and 7th February, abundant rainfall and the cold air mass settling afterwards, created ideal conditions for the formation of frost crystals on icy puddles. On the first day, only the subsun, subparhelia and possibly lower tangent arc were seen. 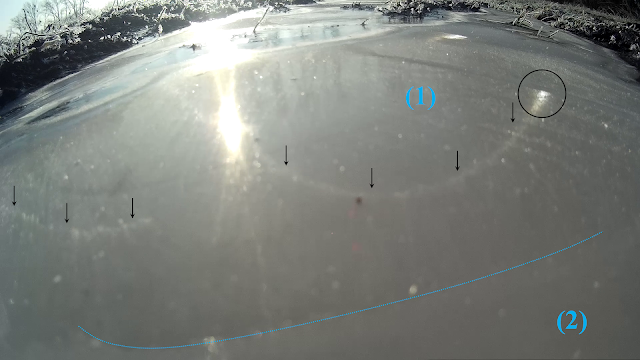 On the 7th, however, more complex halo forms showed up on a huge puddle. Dávid Hérincs made a video of the observation. 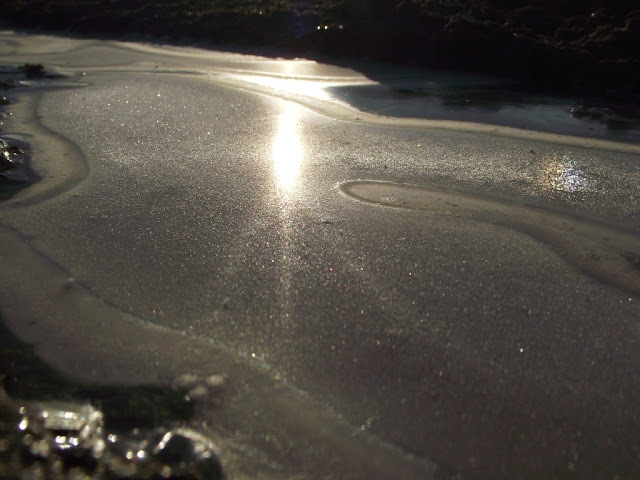 As he noted, the huge puddle had three separate ice surfaces, with different angles of inclination, and thus the sunlight did not meet the ice crystals at the same angles. This could be the reason why the halos appeared on these surfaces slightly differently. 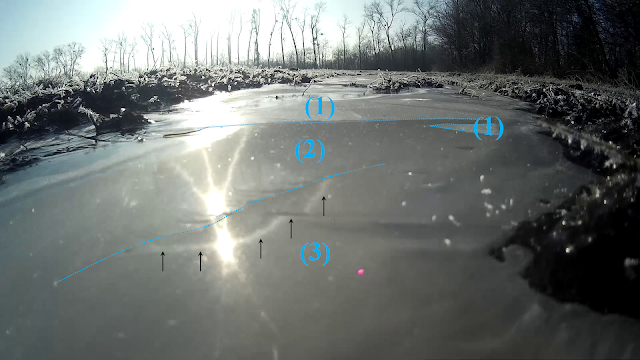 The observer marked these three parts of the puddle in frames cut from the video, and noted that on surfaces 1 and 2 the sharp curving halo arc had white brightenings at a distance further from the previously observed subparhelia, but approximately in line with the subsun (see: first photo). On surface 3, the lower sun pillar was not observable, but a halo form that looked like a subparhelic circle appeared (second photo). 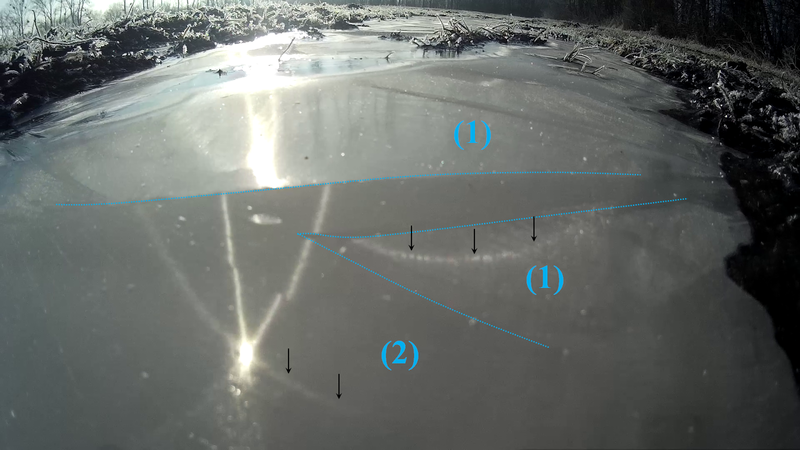 Since these three icy surfaces were located next to one another, at times the halos belonging to them were observed simultaneously (third photo). Any comment and help with the identification of these halo forms are welcome. Further images can be seen on the observer’s Hungarian language website ( 2 ). 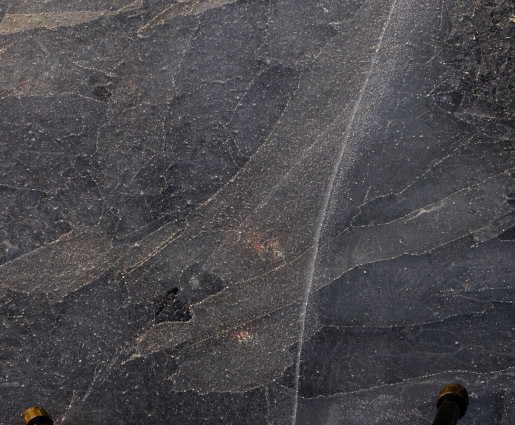 Surface halos in Budapest, Hungary, on 19th February 2018. The full account of Piikki’s observation can be read in Marko Riikonen’s and Jarmo Moilanen’s post ( 4 ) where they also shed light on the problems of nomenclature, and whether the sub- prefix should be used.